The Narberth Dickens Festival is the biggest holiday festival on the Main Line, where downtown Narberth transforms into 1840s London for one December afternoon every year. The event includes period street vendors and food, caroling, musicians, costumed performers, puppet shows, dance performances, ice sculpting, carriage rides, and much more. Kids join in the free scavenger hunt to search for costumed Dickens characters like Scrooge and Tiny Tim, and win a great prize. Easy access to Septa Regional Rail – 3 stops from 30th St Station on the Paoli/Thorndale line. The Festival will be bigger and better than ever this year. The Narberth Business Association is bringing back all the crowd favorites, and expanding with new activities and performances as well. See the website for times and more information at www.narberthonline.com. For photos, interviews, and more information, feel free to contact Ed Ridgway at narberthonline@gmail.com. Hi All, we have been working very hard this year to update our Narberth Police Department to make it the best department it can be. A major part of this improvement is the addition of our new Chief of Police, John Gallagher, who has been coordinating with myself as your Mayor, Borough Council and the Borough office to develop updated policies and plans of action to keep us well protected and safe in Narberth. If you have not already met our Chief (or even if you have), I would like to invite all members of the community to a Meet and Greet with Chief Gallagher next Tuesday, November 13, from 7:00 to 8:30 pm at Borough Hall. Come on by for some light refreshments and introduce yourself. In the interest of keeping all those who live, work and play in our Borough safe, especially children and senior citizens, Narberth police officers are constantly engaged in proactive traffic enforcement with the purpose of deterring bad driving throughout our community. Please know that officers take a zero-tolerance approach towards careless driving, and that speeding is strictly prohibited. Traffic citations will be issued for any and all moving violations, when warranted. Thank you for supporting the Narberth Police Department. The Borough of Narberth and the Narberth Fire Company are donating their 1982 Emergency One Pumper to the Cedarville Fire Company of Cedarville, Arkansas. This is a rural community which was in acute need of an engine but didn’t have the financial resources to buy a new truck. 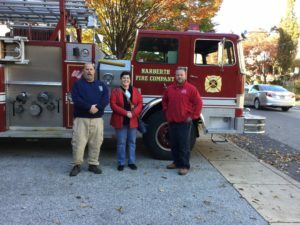 The engine that is being donated has faithfully served Narberth and the surrounding communities for more than 35 years and served at incidents from the Kiddie City blaze to the tragedy at Merion Elementary School. We wish the citizens of Cedarville well going forward and hope they get more years of protection from a fire engine that always did it’s duty for our residents and our community. However, the most important thing that can be done to avoid becoming a victim of theft from auto is…. Please contact me if there are any questions and, remember, we are here to serve you. Thanks for supporting the Narberth Police Department. Narberth Borough Council is looking to fill vacancies on the Borough’s Boards and Commissions. If you have always wanted to be a part of the many projects and activities that are part of Borough government, here is your chance. The link included below will take you to information on what is available and how to apply. Thank you to everyone who attended the Narberth2040 Comprehensive Plan Open House on October 12th! For those who were unable to attend, we want to hear your input on the plan’s draft principles, goals and recommendations which have been developed thus far. The principles are the themes of the comprehensive plan, which collectively form the plan’s overarching vision for the future. Each principle is supported by a set of goals and recommendations. Click here to find the posters from the event. We encourage you to participate in the open house’s voting exercise by selecting three goals which you believe are the highest priorities for each principle (so you get to vote for three goals per principle). Additionally, please feel free to send us comments on any of the specific draft goals. Please email your votes and comments to Jack Byerly (jbyerly@montcopa.org) and Maggie Dobbs (mdobbs@montcopa.org). Ben Hoffman has informed me that he will be resigning his position as a school crossing guard before the end of 2018. Ben is at his corner faithfully every weekday throughout the school year. As a retired volunteer firefighter with the Narberth Fire Department (NFD) of 35 years, a crossing guard for more than five years, and a current member of the NFD Board of Directors, he represents what is best about this borough. It is the students, parents and teachers at Rockland & Woodside Avenues who will miss him the most. Even though I have only been here for a short time, it has been my honor to get to know Ben and work along with him in service to this great community. Please join me in thanking this veteran of the United States Navy for all of his years of service to the Borough of Narberth. Thank you, Ben. Please meet our police personnel…. Matt has been with the NPD for four years. He was a Philadelphia police officer for eight years and has been a proud member of the Army National Guard for 22 years. Matt is a college graduate, a certified pilot and is currently working on a master of science degree. He is married with two children. Dan joined the NPD only three months ago. He was a Darby Borough police officer for 18 months and a Chester County correctional officer for almost a year. Dan is a graduate of West Chester University and the Delaware County Municipal Police Academy. He was recently married. Kelly was born and raised in Narberth and has been serving her community for almost seven years. She worked in public safety and security in Montgomery County before joining the NPD. Kelly graduated from the University of Tampa and the Montgomery County Municipal Police Academy. Her husband is also a police officer. Sean has been with the Borough for more than seven years. He was a Philadelphia police officer for eight years and was promoted to the rank of corporal in that department before joining the NPD. Sean graduated from Villanova University. He is married with three children. Mike is the longest-tenured officer with more than nine years of service to Narberth. He also served in law enforcement before the NPD as a deputy with the Montgomery County Sheriff’s Department. Mike is a graduate of Delaware Valley University and the Montgomery County Municipal Police Academy. He is married with three children. Robin lives in Narberth and has been working for the Borough for 26 years. She is also the Vice President of the 4th of July Committee and is actively involved with the Narberth Athletic Association, St. Margaret’s School CYO and the Boy Scouts of America. Robin attended Eastern University. She has four children. Ben resides in Narberth and has been a crossing guard for the Borough for five years. He was a volunteer firefighter with Narberth Fire Department for 35 years and currently serves on the Board of Directors. Ben is a veteran of the US Navy. Clodagh, who is from Ireland, now calls Narberth her hometown. She has been a crossing guard for the Borough for 14 years. Clodagh worked in the insurance industry for ten years and was a volunteer with the New Horizons Senior Center. Remember, we’re here to serve you. Public Works has scheduled necessary tree pruning and removal work along the North side of Sabine Avenue for Thursday, October 18, 2018. The parking spaces in the MELC lot facing Sabine Avenue will be closed for the day Thursday 10/18/18. Sabine Avenue and the driveway into the parking lot will remain open for the day. The tree scheduled for removal at the corner of the parking lot will take place just prior to 8am, again Sabine Avenue and the driveway to the MELC parking lot will remain open. Tree pruning will continue through mid afternoon Thursday in the closed portion of the parking lot and in portions of Sabine Park. All work is scheduled to be completed Thursday October 18. A raindate of Tuesday 10/23 is set and I will let everyone know if this becomes necessary. Public Works will provide support staff to assist with traffic. I thank everyone for their patience as we complete this necessary work. Please contact me if there are any questions or concerns.